Just a little more than a month remains for senior living and skilled nursing operators to submit entries for the 2018 McKnight’s Excellence in Technology Awards competition. The deadline to enter is July 20. Entries are being accepted at McKnightsAwards.com. Stanley Healthcare is this year’s Platinum Sponsor. 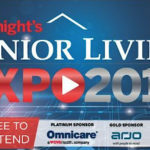 Matrixcare is the Gold Sponsor of the senior living track, and Netsmart is the Gold Sponsor of the skilled care track. Winners will be announced in the fall and recognized online and in print.